My timing was perfect. With Bull Run March Madness now history, I managed to hunt Saturday, go to work on Sunday, and get sick on Monday. During the days before we left for Virginia, with my nerves activated by a recent snow, my anxiety focused on the fear that I would get sick before, or even worse, during our trip. So I am very content to be sneezing and stuffy now. Worse thing is hubby Rick is also now sick. Sicker than me. He is always sicker than me, even if he has the same thing. But this time he really is sick. Before the trip, my field hunter Ozzy had recently recovered from a bacterial infection, but not before having lost some weight. Not being a good traveler, I did not want him to lose any more weight. So my pale, borderline pony Frankie was pressed into service for this trip. After picking up Mary’s mare Spyder, Mary followed me in her car to our staging area in the Walmart parking lot. Alas, no one thought to grab ourselves a quick Starbucks for the road ahead of time. Traveling solo, Trish’s horse was rocking her trailer, so we moved out pronto. Our four trailers would caravan to Virginia from there following Mary in her car. Mary needed to head home a few days early to put on a bridal shower so she had to drive separately. It is a pretty straightforward trip to the Funny Farm in Reva, Virginia. Plus we have done it before. As the convoy rolled along I was struck again with how beautiful this part of Virginia is. During our trip every time the mountains came into view we would point and exclaim, “Look, a mountain!” Reminding us why we come here. Bull Run’s Spree was the top scoring foxhound in the Belle Meade Hunt Foxhound Performance Trials held in Thomson, Georgia on January 20 and 21, 2017. Of thirty-six hounds competing, Spree won three of the four scoring categories: Hunting, Trailing, and Endurance. In the Full Cry category, he was second. * His combined score led the field in points. 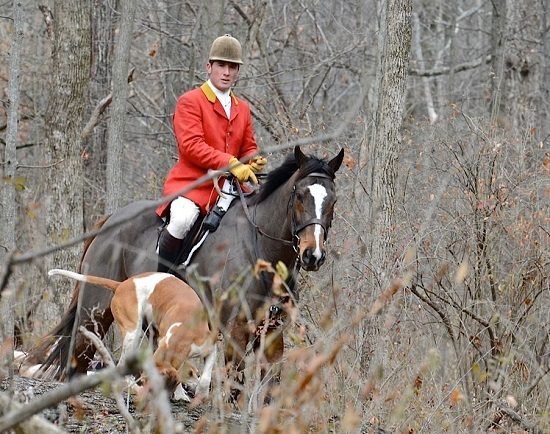 Six foxhounds from each of six hunts competed—Belle Meade Hunt (GA), Bridlespur Hunt (MO), Bull Run Hunt (VA), Farmington Hunt (VA), Fox River Valley Hunt (IL), and Mill Creek Hunt (IL). The three top scoring hunts, based on the combined scores of their hounds from first to third, were: Bull Run, Fox River Valley, and Belle Meade. Trial Huntsman Sam Clifton was called upon during the award ceremonies to announce his choice—the hound he’d most like to take back to his own kennels. Huntsman’s Choice is an honorary award and receives no official prize, but, as in past trials, Sam’s reasoning for his personal choice was worth hearing. In January of 2010, Tennessee Valley Hunt had a three-day joint meet with the Belle Meade Hunt down in Georgia. Belle Meade’s MFH and Huntsman, Epp Wilson, had last hunted with TVH’s MFH Grosvenor Merle-Smith when Gro was huntsman for the Bull Run Hunt in Virginia several years earlier. 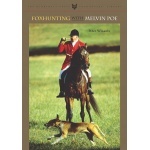 They had what Epp described as an “epic” hunt chasing fox. The two huntsmen had finally organized a recap of that memorable hunt, and the expectations of both men were very high for the weekend. Twelve of us Tennesseans trekked south to Georgia just west of Augusta. Included were Grosvenor, his wife Rosie Merle-Smith, MFH, and our TVH huntsman Beth Blackwell who brought about eleven couple of Penn-Marydels. The Junior North American Field Hunter Championship competition that began modestly twelve years ago between a handful of geographically-close Virginia hunts continues to expand in scope. This year’s competition involved juniors from twenty-seven hunts located across six MFHA Districts. The program is succeeding because it’s purpose rises above just competition. Founders Douglas Wise, MFH, Old Dominion Hounds and Iona Pillion from the Blue Ridge Hunt had a larger dream: bring children to new hunting countries and open their eyes to the fact that these playgrounds don’t just happen to be there for them by chance, but have been nurtured and conserved for the perpetuation of wildlife, open space, and for those who treasure the natural world. “We want these kids to know what a conservation easement is,” said Marion Chungo, one of the organizers.